The reality of family life, means that most weekends we spend a lot of time apart. Its all part of being the family of an elite athlete. We try really hard to make sure our youngest two don’t miss out so Sundays are all about doing things separately. I rely on getting sent photos like the one above to keep me sane on the days when I’m poolside – and vice versa when it is Mr C’s turn. Yesterday, Violet and Tara had their idea of a perfect autumn day – simple childhood pleasures like picking conkers and riding on their Uncle’s tractor. We store our caravan for the winter in my brother-in-law’s field which usually means a trip out to their house for at least 3 of us. Mr C took the girls yesterday and they had the best time – Violet loves playing with her cousins and their dog – she is a child that needs vast amounts of open space and loves sunny, autumn days playing in the field. 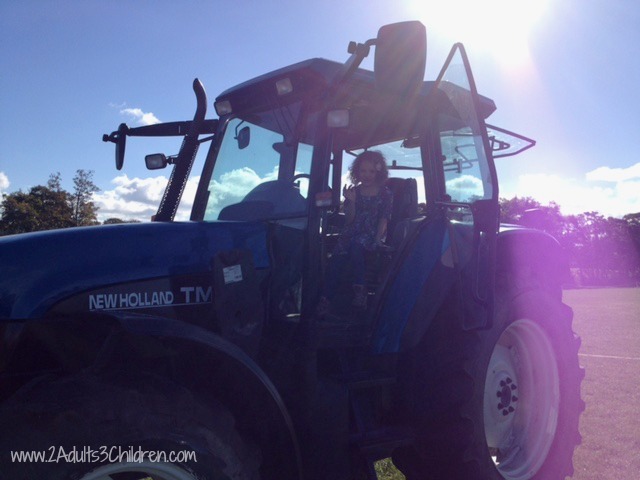 Tara made the most of the opportunity to ride in the new tractor – doesn’t she look tiny? 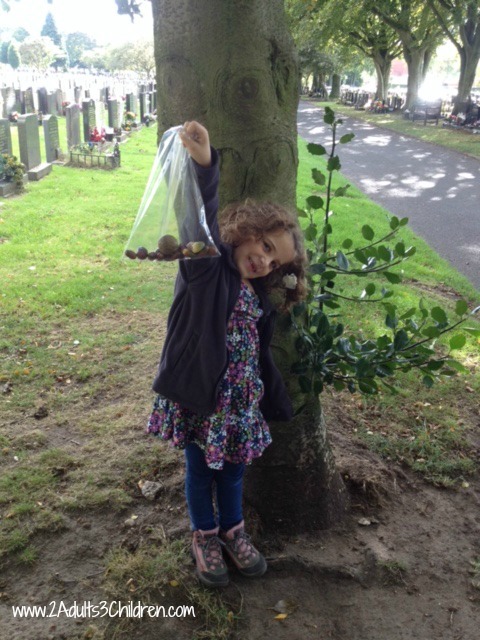 The afternoon saw Tara being ever so proud of her haul of conkers – they are getting few and far between around here now so this bag took quite a bit of finding. The sad news is that when she came to take them into school this morning, we couldn’t find them. We think she might have left them outside when she was playing with one of the neighbour’s granddaughters yesterday. Here’s hoping we can find some more! I always said that when I set up this second family blog, I would share more of the ordinary family moments – a real snapshot of what life is like with 2 Adults and 3 Children. These pics are quick snaps but more special as they keep a family together when we are apart. And also Mummy, Daddy & Me Makes Three’s Ordinary Moments linky.